A husband, who identified himself as Fred, reported an unknown object near the International Space Station. On December 28, 2014, they were looking at the live stream of the space station at around 9:40 PM Sydney Time and when the ISS was approximately over France, they saw the camera moved and focused towards a mysterious object. 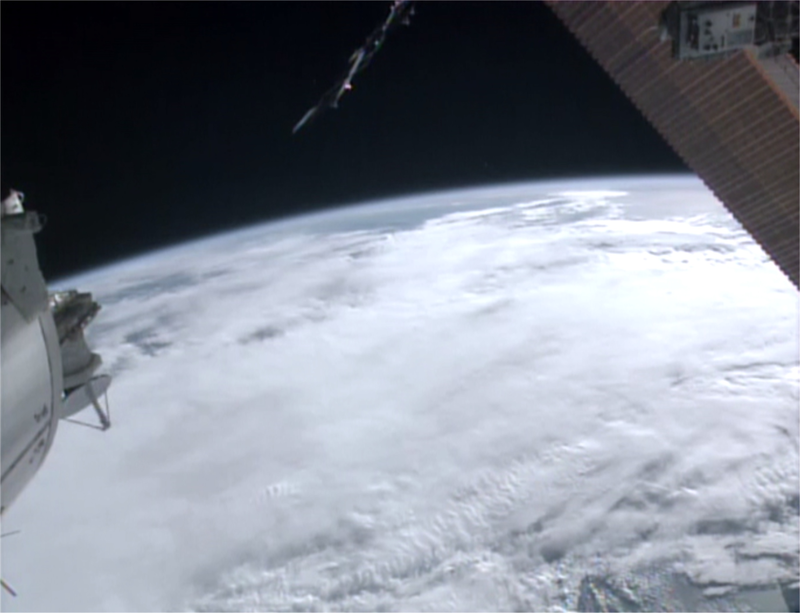 They were not sure if someone from the ground or the ISS manipulated the angle of the camera. They suspected that somebody moved the camera to take a better look at the unidentified flying object. Upon seeing the object, the reporting witness said that he, his wife, and daughter were surprised and could not determine what they were seeing. He described the object as having small, blue flashing lights in the middle. His daughter also noticed that the flashing lights turned red as well. His wife decided to print the object quickly. Fred said that the camera appeared to focus more on the subject matter and then zoomed in, but not close enough as they were hoping. The camera then zoomed into the clouds before the live stream stopped, Fred stated. Fred said that they stayed for a while and waited for the live stream to reappear. When the live stream finally got back, Fred claimed they heard a voice with Russian accent saying computer rebooted as requested. He said that the object, they saw, seemed to move at the exact similar speed of the ISS. The camera just started to move and look for it when it appeared on the screen. Fred would like to know if the object, they saw, was a satellite or something unexplainable. He expects that somebody else also saw the mysterious object.